Sony ZG9 8K TV hands on review | What Hi-Fi? Is Sony’s first 8K model a match for the Samsung Q900R? At CES 2019 Sony took the wraps off its new Master Series TVs and, while the AG9 will be appealing to many, it’s the ZG9 LCD that created most of the headlines. Why? Because it’s Sony’s first 8K TV. Available only in very large screen sizes (85in and 98in), the ZG9 will represent the pinnacle of Sony’s TV engineering prowess when it launches later in the year (no release date has yet been proffered). So, just how excited should you be about this Sony 8K TV? We went hands-on to find out. It goes almost without saying that the Sony ZG9 is huge and imposing, but it’s also rather pretty and elegant, particularly on the long-legged floor stand, which comes with the 98in model. The standard-height feet that come with the 85in model are also pleasingly industrial in design. It’s a thick display as a result of the size of the screen and use of a direct LED backlight (and the speaker system - more on which below). If it’s super-slimness that you’re after, you might be better off with the ZG9’s OLED sibling, the 4K AG9. The ZG9’s 8K resolution necessitates the enhancement of a couple of Sony’s existing headline features. 8K X-Reality Pro takes care of the upscaling, using a new, dedicated 8K database for apparently more precision and detail, while 8K X-tended Dynamic Range Pro boosts brightness when necessary in specific areas and works in conjunction with the Backlight Master Drive feature, which independently controls the backlight's LED zones. For what it’s worth, Sony isn’t (yet, at least) being specific on the number of zones that the ZG9’s backlight has. HDR of course forms an important part of the 8K ZG9's repertoire, and it's confirmed to support HDR10, HLG and Dolby Vision. HDR10+ isn't on board, with Sony claiming it "doesn't need it", as its own processing does a similar job. 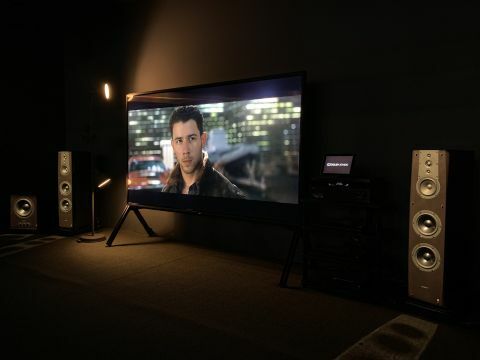 This rings as a little disingenuous to us: if Dolby Vision is worthwhile, there's no reason that HDR10+ isn't, too, and that's certainly the attitude of Panasonic and Philips, who are supporting both formats on their 2019 sets. Beyond the core HDR format support, Sony is also going big on support for cinematic standards, with both IMAX Enhanced and Netflix Calibrated on the features list. Both are designed to give you a picture that as closely as possible reflects the creator’s intent, which is very much inline with the claimed intentions of the Master Series. Sony’s once again turning to Google to provide an operating system, with the ZG9 - like its siblings in the company’s overall 2019 range - launching with Android TV 8.0 Oreo on board. Interestingly, Philips claims its 2019 TVs will launch with a later version of Android TV, 9.0 Pie, and it would be a bit of a shame if Sony was behind the curve. That said, we expect Sony to once again add YouView into the mix, which not only makes the off-air TV experience far more enjoyable, but also adds catch-up apps that Android lacks - namely, ITV Hub, All 4 and Demand 5 - to the otherwise extensive selection. There’s a degree of Apple integration, too; not in terms of Siri, but in the integration with the HomeKit smart home platform and the addition of AirPlay 2 for wirelessly sending music and movies from an iPhone to the TV. We’d really like to see iTunes Movies and its peerless selection of 4K HDR films in there, too, but that’s a Samsung-only thing, at least for the time-being. If you’re someone who prefers to play movies from an external source, your interest will likely be piqued by the statement in the press materials that the ZG9 is “to be updated to HDMI 2.1”. We’re taking that to mean that the TV’s sockets are HDMI 2.1-ready but that can’t be listed as such until certification is complete, which may be after the launch of the telly. We’ve contacted Sony for clarification. Before our demo, Sony Visual Products' chief engineer, Toshiyuki Ogura, talked at length about ideal viewing distance for 8K content. We could write an entire magazine on his research, findings and opinions on the matter, but the long and short of it is that he believes a distance of 1.5x the height of the screen should be between the display and your peepers for the optimum 8K experience. Watching 8K on the ZG9 at precisely this distance (183cm from the screen), it’s very hard to disagree. You could sit closer and not see the individual pixels, but we think that would be overly intense. At this sort of distance the image is awesomely, vision-fillingly immersive, packed with detail, and fabulously deep and three-dimensional. We know from our tests of the Samsung Q900R that 8K ‘works’ from further away, but we can well believe, on this evidence, that 1.5x the height is ideal. Sheer resolution is far from all that matters with a set such as this, and the Sony ZG9 also produces really lovely colours, with Rio Carnival brought to life in rich, vibrant hues that at no point veer into unrealism. It’s impossible to be sure without a side-by-side comparison, but we suspect that the ZG9 isn’t quite capable of hitting the brightness peaks of Samsung’s Q900R, but the contrast of its image is pretty darn spectacular in its own right, with bright whites punching out dramatically from the night sky, which looks impressively black in the carnival clips. Those clips fill the screen, though, and when shown some letterbox content (Jumanji: Welcome to the Jungle) we could see light from the main image creeping into the black bars above and below, suggesting that, while Sony has clearly improved the ZG9’s backlight over that of the surprisingly compromised ZF9, it might still be short of the uncanny quality of Samsung’s latest, top-of-the-range QLEDs. Like Samsung, Sony is also acutely aware that, with no native 8K content to watch now or even in the near-future, how the ZG9 handles lower resolutions is vitally important. We only got a proper look at 4K during our brief demo session, but it looked very good indeed, with smooth edges, excellent detail and very little in the way of banding or artefacts. We’d obviously need to test the upscaling further, but there was certainly no indication, at this early stage, that the ZG9 gives anything away to its native 4K siblings when it comes to displaying 4K content. The aim of Sony’s Master Series TVs is to preserve the creator’s intent as faithfully as possible, and that isn’t limited to the picture performance - sound matters, too. Key to getting the audio right, according to Sony, is ensuring that it sounds as if it’s coming from the screen, and that’s particularly the case with bigger screens and shorter viewing distances, as any incongruity between picture and sound is more pronounced. Of course, with Sony’s OLEDs the sound really does come from the screen, as actuators vibrate the whole panel in order to create the audio. Unfortunately, that isn’t an option when a backlight is involved, so the ZG9 instead uses four, front-facing drivers; two built into the chunky bezel above the screen, and two below. The audio demo was certainly compelling. Compared to OLEDs such as the AF9, it certainly doesn't feel as if the sound is coming as directly from the screen, but it’s a lot better than most TVs in that regard. What’s more, this ZG9 sounds weightier, punchier and more dynamic than the OLEDs. This helps it put in a more convincing performance as the centre speaker in a home cinema system, which is enabled - as it is on the AF9 - thanks to a pair of speaker terminals on the rear of the set. That said, the ZG9 is clearly still an acoustic mismatch to big, full-range speakers such as those in our demo, with the central effects lacking the richness and fullness of those coming from just a few inches to the right and left - even though the ZG9 does sound rich and full-bodied for a TV. It’s worth remembering that everything written above is off the back of a brief demo session, and so represents a series of early impressions rather than anything even approaching a final judgement. That said, we’re cautiously optimistic about the Sony ZG9 8K TV. We really like the fact that it revels in its chunkiness, using it as a vehicle for better speakers and an imposing but elegant design. We also appreciate the continuation of the Master Series’ goal to reproduce the content creator’s intent as faithfully as possible. That said, with 8K content still so far away, Sony’s got an uphill task in convincing anyone that they should fork out a presumably astronomical sum for the ZG9. And then there’s the small matter of the Samsung Q900R standing between it and those 8K early adopters. Until we get the ZG9 into our test rooms for a full review, we can’t really draw any firm conclusions. We’re sure looking forward to properly putting it through its paces, though.